It’s been so long since I’ve posted anything, but I have had so much to do lately that I barely have had time to do my work, let alone anything extra curricular. But as the title would insinuate; I am in Berlin!!! This is the third week of my German Intensive course (out of four) and it is very hard, but I am starting to see very encouraging glimpses of hope in the horizon. It’s been so long since I have studied German grammar, and as those who try to learn it would agree with me, it is not really the easiest language to learn. The course is from 9 am to 3 pm every day (and then there are the Hausaufgaben), so I have little time to see the city – nonetheless, I make it a personal goal to see parts of Berlin every week, even if it is just a cup of coffee in a Kreuzberg café. Like they say, you can’t learn the language if you don’t use it in public (or I say…). One of the lovely members of Beinglorious was in Berlin at the start of my course (for the umptheenth time :)) and we made a coffee date. She was very kind about my many uhh’s and aaahh’s and eeeeh’s, stuttering and butchering my way through sentences in German (she is German, just to clarify the situation), but I actually think it helped a lot – it’s only when you verbalise what you learn throughout the day in a stuffy classroom that you are aware of what you are saying and in what situation. We came past a second-hand bookshop and of course had to stop a couple of hours, browsing. There was a lot of good literature in there, and I bought a couple of books, one of which was Ovid’s Love Books. We had a segment of his literature in one of the earliest semesters at uni. From what I can remember I found it very brazen, something I didn’t expect, and I am looking forward to reading it in German. E-reader with Gertrude Stein as screensaver – what more could a gal ask for? 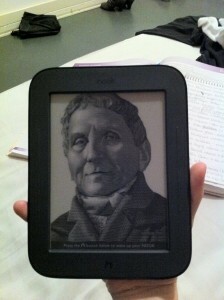 In other news, I am now the proud owner of my very own e-book reader!! Yessir, bobsky, hubby came to visit me in Berlin with a nice red packaged present containing an e-reader. He of all people can appreciate an affection for electronica, and so he thought it was only suitable, since I had been rambling on and off about e-readers the last 2 years, but never actually owned one, that I got one for myself 🙂 Unfortunately, I don’t have time to read in it so much these days, but I am betting on it being the best 3-hour wait in the terminal and 1-hour flight back home ever! There are already over 500 books on it, so the only trouble I will have is to make up my mind which one to start on… Unfortunately, there is as of yet almost no literature in German on it. Where does one buy German literature for one’s e-reader? 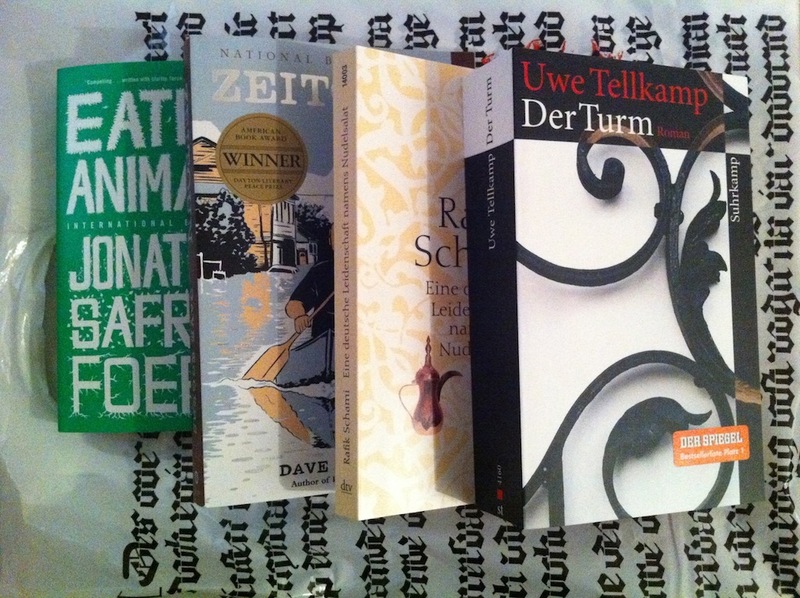 Yesterday I went into town after uni (just to not go straight home and hit the books) and I of course ended up in a bookstore – endresult: 4 books, 2 postcards and a bookmark. Since I have become more aware of the massive (and in many cases, unnescessary) meat consumption, and Jonathan Safran Foer at the International Author’s Stage in Copenhagen made such an impact on me, I had to buy his book – I’ve heard it’s not that rah-rah, but then again, I could be surprised. And of course since I am in Germany I picked up Uwe Tellkamp’s ‘Der Turm’ that was much hypened in literary circles back home. Rafik Schami’s book I bought because I want to get some sort of feel for Germany’s Migrantenliteratur – not a lot of that going on in Denmark, apart from Manu Sareen’s children’s books, and a couple of short stories in the 2007 Anthology of Forfatterskolen, I am having trouble coming up with what else is there, so I am speculating that it really is a blank spot in Danish literature. The last one I bought is Zeitoun by Dave Eggers. It is set in Bush-era and Hurricane Katrina time, and it questions the political and social structure of the US, when a Syrian-American man is arrested and held imprisoned for 23 days without proper legal process in the aftermath of Katrina in New Orleans. 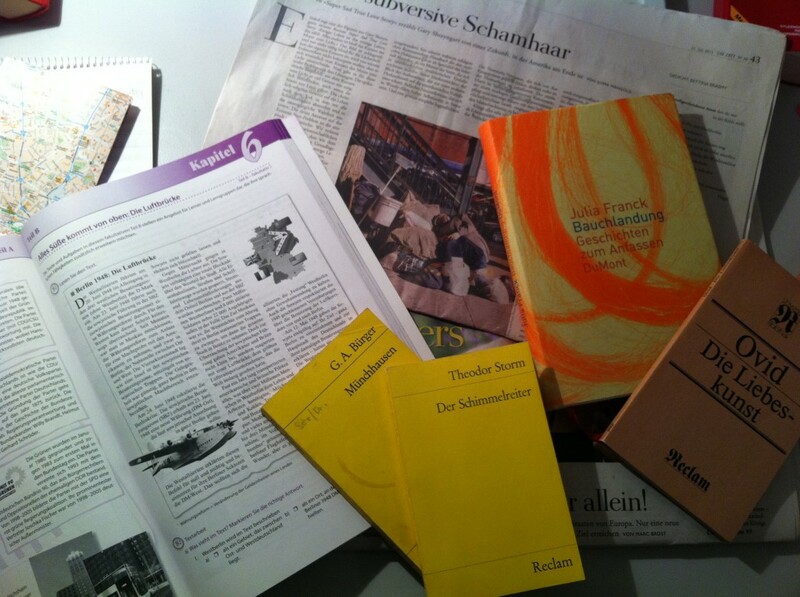 Anywhoo, enough of this, I am going to do some weekend sightseeing: stops along the way include Marga Schöllers Bücherstube, Käthe Kollowitz Museum, Zara (not really a sightseeing/cultural point, but if I come across one, I go into one), Dalí at Potsdamer Platz and, if I have time, a quick stop at the 15. Internationale Berliner Bierfestival on Karl-Marx-Allee.